Go Doctor Who - All the Doctor Who shopping you can do here! 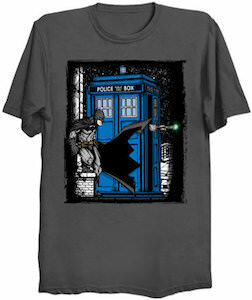 Now you can be wearing this Batman Meets The Tardis And The Doctor T-Shirt. And this t-shirt brings your love for the Doctor and Batman together on one shirt. You can get this t-shirt in styles for men, women, and kids and it comes in many colors and sizes and is also available as a hoodie and a baby bodysuit. On the Doctor Who t-shirt, you can see the blue Tardis and Batman sitting in front of it looking a bit suspicious and then from the Tardis you can see the arm of the Doctor with the Sonic Screwdriver sticking out. It is fun to have a shirt where both your interests come together so click on the image to see all your options. Doctor Who fans can now go to the beach wearing this fun 13th Doctor Striped Bikini Top. The bikini top is available in women’s junior sizes XSmall – 3XL and they are all made from 80% nylon with 20% spandex and it has a 100% polyester lining. The bikini top has a dark blue color with on it the famous stripes that are the same as on the shirt of the 13th Doctor. On the back there it is just the straps that are gold in color. And besides a fun bikini top, this could be just a fun top to wear in summer. And if you want to look even more like the doctor then you are in luck as they have bikini bottoms too. Doctor Who fans can now wear this Brilliant Tardis Skirt With Yellow Suspenders. This Doctor Who skirt comes in women’s junior sizes XSmall – 3XL and they are made from 3% spandex and 97% cotton and have two pockets. On the blue skirt, it shows the picture of the Tardis and under it, the word the 13th Doctor loves to say and that is “Brilliant!”. Sure you can get the perfect fitting skirt but as we have seen with the first female Doctor Who suspenders are cool and that is why this Tardis skirt has some yellow suspenders that are adjustable in size. We all need clean underwear and you can be wearing these Black Doctor Who Boxer Shorts. If you wear boxers and are a Doctor Who fan then you are in luck as these boxer briefs are black and are covered in the Doctor Who logo that looks like the Tardis and spells DW. Your new Doctor Who undies come in many men’s sizes and all are made from 95% cotton and 5% spandex and have a nice black waistband that also has the Doctor Who logo on it in the center. Sure not many people won’t see you in your underwear but you will know what amazing boxers you are wearing. Doctor Who fans that need to store cash and cards can now do that in this Tardis RFID Protection Wallet. 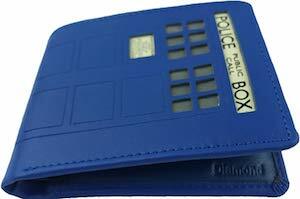 This Doctor Who wallet is made from premium leather and is Tardis blue and has the doors of the Tardis on the outside complete with cutouts and the signs of the Tardis. This Doctor Who bi-fold wallet has RFID protection so that you info is secure inside it. There is plenty of room inside this wallet for pair money and coins and there are lots of pockets to for cards including a flap that hold two pockets for ID cards as they have windows so that you never have to take you card out if they ask for ID. Now you can enjoy the music from the Doctor all thanks to this Doctor Who Series 11 Soundtrack. This CD will bring you the music from the 13th Doctor so that you can enjoy it over and over again or even feel like it becomes part of your life just like it does to the doctor. 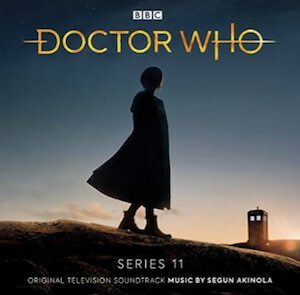 The music is composed by Segun Akinola and he did a great job on Doctor Who series 11 and he is one of those composers that we will hear a lot more about in the future and maybe it is all thanks to the first female Doctor Who. Now there is this amazing looking Dark Blue Tardis Hoodie that is just perfect for a Doctor Who fan like you. This Doctor Who hoodie is made from 80% cotton and 20% polyester and comes in men’s sizes XSmall – 2XL and will look nice on women too. 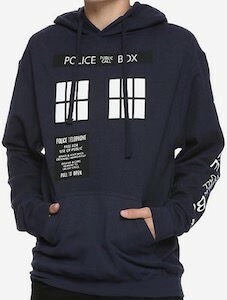 On the front of this hoodie you find the giant pocket like we all like from a hoodie and above that you can find the windows and the signs you expect from the Tardis and then on the sleeve you find the top sign from the Tardis that says “Police Public Call Box” which just look just perfect on a Doctor Who sweatshirt. 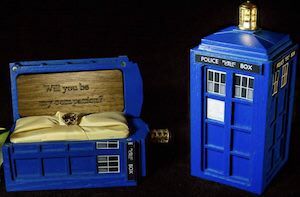 When the time comes to ask your someone special to marry you then you can do so with the help of this Tardis Ring Box. Doctor Who fans can have this amazing looking Tardis Ring Box that is made to look exactly like the Tardis complete with a gold flashing light on top to make it look even more like the real Tardis. Inside the box, there is a nice spot for a ring and in the lid, you can have an engraved piece of wood that can already send the message you want to get across. And if you are looking for that special engagement ring then you should have a look at this Tardis engagement ring as it is perfect for in this jewelry box. 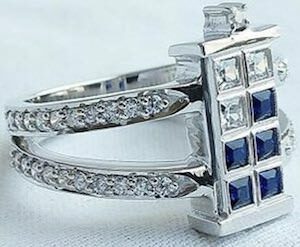 Now your ask the Doctor Who fan in your life to marry you all thanks to this Tardis Engagement Ring. This Doctor Who ring is made from 925 sterling silver and the ring has the famous police box in the middle with two bands going around merging on the back. The silver ring has an inlay of many Cubic zirconia gem stones to make this ring really stand out making this a great ring to get yourself of to give for that special occasion. Wearing this ring shows you love for Doctor Who as it is all about the Tardis on your finger. Time for some candy all thanks to this Tenth Doctor PEZ Dispenser. 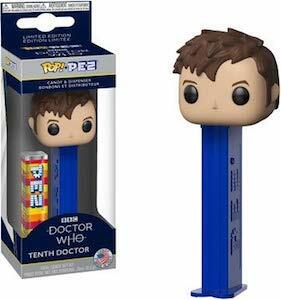 This PEZ dispenser is blue with room for a pack of PEZ candies inside it and then on top of it you can find the head of the 10th Doctor Who and when you fold the head back there will be a candy coming out just like any other PEZ dispenser. And this fun Doctor Who candy holder comes in a nice box that lets you look inside so that you can keep it in new condition if you like and there is a pack of PEZ candy in there too.